This writing tip came to me on two separate occasions. Unfortunately, I didn’t have my phone with me to take a picture either time. We’ve been talking about show don’t tell in writing. This subject came to mind as we were driving to Myrtle Beach. Off in the distance, I saw a storm cloud approaching us, thick and dark and unusually round on one side. It reminded me of the spaceship Enterprise. Your turn. Time to get out your bullet journal. You can label this section what you wish. What I want you to do is to keep notes about things you observe during your daily lives. I’m sure you’ve had moments like the ones I described too. Maybe they’re fanciful and you laugh at yourself. Or maybe they’re insightful. Either way, I want you to not only write down these moments, I also want you to look for them. Something ordinary, describe it in fine detail. 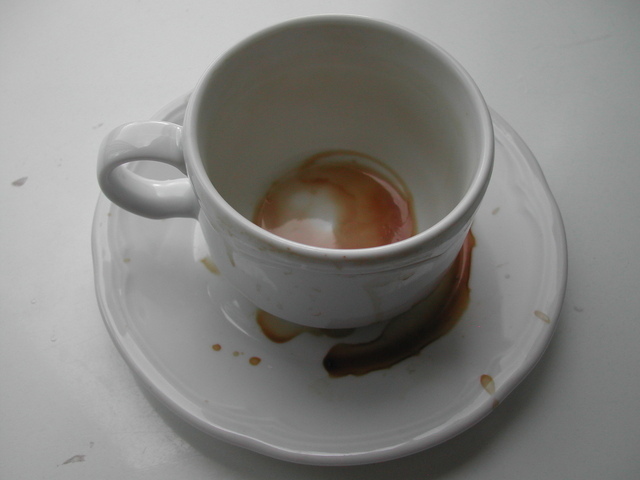 The way the coffee has spilled onto the saucer in the above photo. Something out of place, describe the details and how it’s different. An old wooden boat that has a tree growing through it. Something unusual, describe the details and what it reminds you of. A rare bird landing on a branch near you. A change, describe the first moment you felt the change and all of the stages through to the completion. The changing of seasons, the cooler mornings, the slight change to the scents in the air, the blooms starting to shrivel. A moment, doesn’t have to have lots of action. Maybe a moment of nothingness. Now describe an opposite moment. Sitting on the back porch watching the clouds go by. Stopped on the side of a highway as cars zoom by. A feeling, describe it as it happens (or right after). Don’t wait to recall it. You’ve spent the day having fun, not thinking about any issues, out of nowhere they ram into you leaving a big gaping black hole in your belly. You may or may not use these in your writing, but writing these down will train your mind to look for the small details as your write. These details will make a difference to the depth of your description. This will enhance your writing and make it richer.